A Forces Support charity shop in Dunstable may be forced to close after an attempted break-in at the weekend. The charity shop in The Quadrant was targeted by burglars for the second time in two months on Friday night. Although they did not get into the shop, the damage to the doors will cost the charity hundreds of pounds to replace. Juli Readfern-cook, shop manager, said: “We had a break-in at the shop in December and the police are investigating, they have CCTV of the incident. “Unfortunately, at the weekend, we were targeted again, they did not manage to get into the store because the door was so badly damaged it was hanging off..
“They smashed the doors and they have been taken off their hinges and we have been left with a large repair bill, the doors can not be repaired, we need brand new ones and it is going to cost over £600. “The police are dealing with all the incidents, but we have not got the money to keep on repairing the damage caused by break-ins. It is soul destroying for me and my staff. The shop has continued to open as normal since the attempted break-in overnight on Friday. 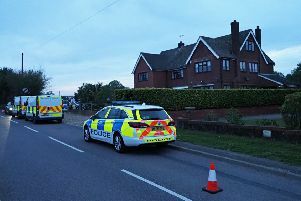 Bedfordshire Police are investigating the incidents. A spokesman for Bedfordshire Police said: “We have received a report of a burglary, reported on 14 December 2018, and an attempted burglary, reported on 26 January 2019 at a charity shop in Dunstable. “An investigation into the incident that happened last year is still ongoing, and the officer investigating this case has been made aware of the most recent incident. The officer has been in touch with the victim to let her know how he will be progressing the investigation. “The most recent incident is reported to have happened between 5.30pm on Friday (25 January) and 9am on Saturday (26 January). Forces Support aims to raise money to provide general maintenance in the home and garden to families who have lost someone in the forces. Projects it has worked on include creating memorial benches for fallen servicemen. The shops across the country are the main source of the charity’s income.